Chapter 3 Page 13 is posted. Snow-by-Night talks to an old friend and a quest is born. 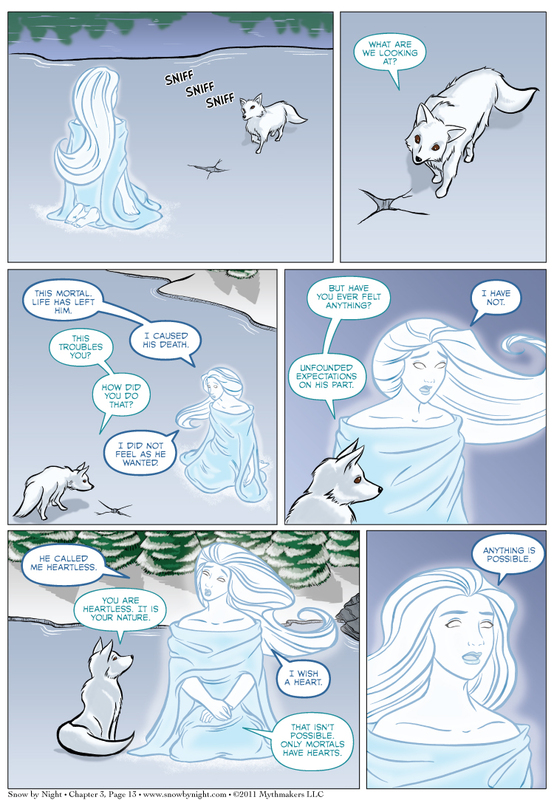 To see a preview of Snow-by-Night on her quest, vote for Snow by Night on Top Web Comics. Link is broken (the “http://http//” mistype). Fixed. I typed the journal with a bit too much Christmas cheer last night. I think you might be missing a “for” in Snow-by-Night’s line, “I wish (for) a heart”. :) Keep ’em coming, I love this comic more and more with every page! Actually, that phrasing is deliberate. Snow-by-Night is using an archaic construction of the word wish. She’ll do this from time to time. Her mastery of language is haphazard and collected over centuries. I’m very glad to hear that you’re enjoying the story so far. I’ve got so much more to share with you, and Brit’s art for the rest of this chapter is breathtaking. Oh, so many good things in store. Ohhhhh, ok. I have officially learned something new today! So, animals are boring to talk to, but actually very pragmatic and sensible! Nice.